The transcription of the French account of the 1835 banquet is now complete, and available here. The translation is nearly done. I’ll put it up as soon as it’s ready. In the meantime, you could always try using the online translation tools that I cover in https://mikegulliver.wordpress.com/2012/06/01/online-translation-tools-thoughts-and-challenges/to access a rough version of the text. And the road is shorter when it is walked as two. We can express ourselves just as well with eyes, and hands, and smiles and lips. That you, poor speaking people, will never understand. That paints our words, and speaks to our eyes? Have nothing that is hidden to our questing minds. Where I might not follow, without also falling like you. To whom should the glory of this marvel? Which transforms the beast into a thinking being? Arise… their banquets are also your own? And your fingers will unite you to the human race. The modest creator of an art that is nearly divine! We should come and reawaken our love by celebrating him. And thank God for our Freedom. P.S. By the way – I don’t mind you reproducing any of the text of the banquets for wider purposes… but if you could credit me with the translation I’d be grateful. 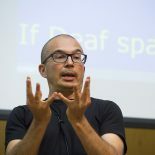 Of course the poem belongs to the Deaf community… as does the essence of the translation. But I think it’s important to make sure that the translation and texts remain attached to an academic context where their meaning can be critically, and reflexively examined. Thanks for your translations! This is valuable stuff, especially for those of us who can’t read French beyond the occasional merci and beaucoup! No problem – glad to be of service. I’m sorry it’s taken me so long to get to it… for some reason, academic work with the Banquet documents is eligible for funding, but no-one seems to be interested in funding a translation… and that, of course, is where we have to start. can u also put it up in French??? Berthier’s poem in the French version runs from the bottom of p25 through the top of page 26. Hey Patty – I don’t know if Harlan’s aware of this – I did scout around before I started and only Bernard Mottez’ (and offshoots) translations of the ’34 banquet appeared to be available. Feel free to pass on information about this to him. What I’m making available is some of the data that I based both my Masters and PhD work on… the Banquets are cited by so many as evidence of early Deaf identity discourses – but critical examination of them is almost completely lacking. What I found was not only evidence from the banquets of something much richer than had been unpacked before – but also evidence that only one side of the banquet story had been told. Yes – they are discourses of Deaf identity. But they are only one story of Deaf identity from the 1800s, and there are many more than have yet to be told. Without a translation, no real debate can be opened up… and no discussion of those ‘other’ Deaf identities can be had. very nice story – thanks Mike – I love to dig deeper and deeper for stories about deaf people and how they contribute to advancing the society. Cheers! This entry was posted on June 13, 2012 by Mike Gulliver in DEAF history and tagged 1835, Banquets, Berthier, Poem.